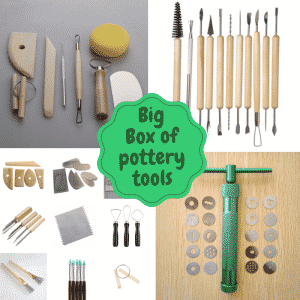 When it comes to pottery tools – Kemper is a well-known brand that produces Kemper Tools. They have handcrafted american tools for the Ceramic Arts community for over 50 years. Kempte tools can help all ceramicists from hand-builders to wheel throwers. In this article, we will be listing the various Kemper Tools that Kemper has, we will explain their purpose, and list a few places where you can purchase Kemper tools. This grouping is geared towards people who want to get sets of things and beginners. One of their well-known basic Kemper tool kits is this, which is recommended for beginner wheel throwers since it has all the tools needed for wheel throwing in it. Kemper brushes range from semi-soft bristles to wire bristles. These are great for either creating texture on a piece such as fur, stippling, grooves, and so on. Another benefit of the Kemper wire bristles is that they are great for scoring – so you can slip and score pieces easier before attaching them together. Get a Kemper wire brush from here. Kemper Calipers are great for figuring out the circumference of a piece and for transferring measurements when sculpting a piece as well. Calipers are also great for when you are throwing a lid to a jar or creating a multi-piece vase. Get your Kemper calipers from here. These carving tools are geared towards getting into tiny spaces and creating very detailed carvings. 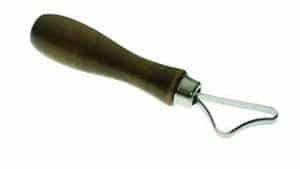 Kemper carving tools are great for hand builders who need extremely precise details and those who are carving their thrown work. Kemper clay cutters are great for creating duplicates of a shape over and over again. Kemper specifically has different shapes such as roses, butterflies, and teardrops that can be cut out using the clay cutter. 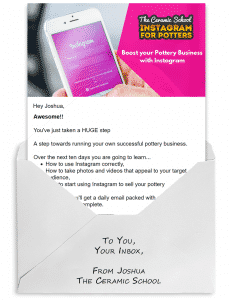 To get yours click here. Kemper clean up tools are made for getting in the nooks and crannies to clean away excess clay and glaze. This is great for when you need to go back into a scraffigo carving to clean up your lines and get little bits of extra clay out of your corners. Cutout tools are primarily used for cutting out excess clay or creating designs by cutting away clay from a piece. 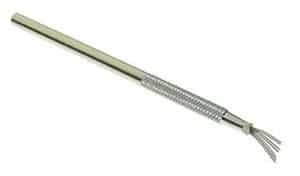 These tools are handy if you want to create intricate work that is pierced (e.g. like Stearns ceramics work). Kemper drills make it easy to poke holes in clay without sacrificing the integrity of the clay itself. Super useful for making salt & pepper shakers or turning something into a hanging piece. Files and sanders are beneficial for both greenware and bisqued pieces. The greenware files are great for cleaning up handbuilding seams while the bisque sanders do wonders for cleaning up rough spots on the bottom of pots. These heavy-duty tools are great for demanding projects in both handbuilding and wheel throwing. When you have to carve and sculpt large amounts of clay these are your go to tools. Get some here. These hole cutters are great for piercing work for designs. Another use for them is to create flower pots or hanging pots as well. To get some hole cutters click here. The knives and saws that Kemper carries is great for cutting, trimming and carving away on clay and other mediums as well. These blades are sharp and will get the job done quickly. Pot lifters are vital for both beginner and more experienced potters who need a helping hand getting a pot off the bat. If you think you need help getting a pot off your wheel then get a pair of pot lifters here. Ribbon tools are another carving series that Kemper carries to get into small areas where it would usually seem impossible to get to. This series has different sizes of ribbon tools which can be great for carving details of varying sizes. Buy from here. Kemper carries ribs of all different mediums and sizes. These range from metal to plastic and wood as well. They even carry ribs to create textures in thrown or handbuilt pieces. Buy from here. Scrubbers contain sandpaper on one side and a sponge on the other. This is beneficial for wet sanding your greenware or bisqued piece to ensure clean edges and smooth out rough areas. Kemper also carries sponges and sponges that are on sticks to reach deep into pots as well. Kemper has a specific line that is geared towards scraffigo. The allure of this line is the very tiny ribbons at the ends of the tool which can be good for creating precise scraffigo carvings. These sticks are beneficial for potters who want to shape their work while keeping the opening of their pots small. The long handles and curved ends allow for your work to not get damaged while shaping the pots overall shape. Kemper Dipping Tongs are o help attain a flawless look. Four sharp gripping points make minimal contact so glaze fills in any marks. Tongs help potters who are not able to properly grip a pot with their hands to hand dip a pot. It ensures that no fingerprints are on the pot and it is a clean and precise dip. Get one here. Trimming tools are vital to removing excess clay from wheel thrown work. Kemper makes various different sizes and shapes to fit every potters need when it comes to trimming. Get just one of many trimming tools here. Turning tools are used primarily to shape, contour, and trim both clay and plaster forms that are on the wheel. Similar to wood turning it takes away the excess clay or plaster while the wheel spins to create the shape you desire. Wire cutters are useful for cutting pieces off of the wheel and cutting blocks of clay up. They can also cut sculptureng with many other uses as well. There are also different wire types that can create different in the clay as well. Get a wire cutter here. Kemper wire tools come in various shapes and sizes. They have a lot of different purposes and can be used on both handbuilding and wheel thrown projects. It all just depends on the wire tool size and shape you think you need for your project. Wooden modeling tools are used for cutting, slicing, smoothing, contouring, and decorating patterns in soft clay. This is great for sculptors when it comes to smoothing out and creating lovely designs on their work, but it can also help wheel throwers spice up their work as well. Get a set here.